Momma Told Me: Blog POP! School Rules is coming to a blog near you This Week! 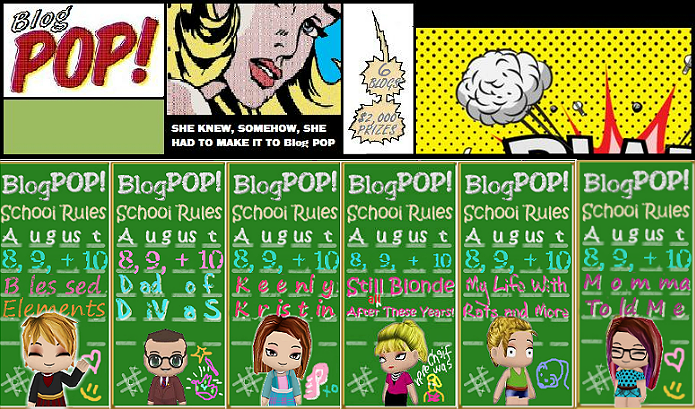 Blog POP! School Rules is coming to a blog near you This Week! Kicking off August 8, and running through weekend is Blog POP! 's annual School Rules giveaway event. Don't have a school aged child? No worries, this event is still for you- whether you're celebrating a few extra hours of peace in the neighborhood after dusk, more time to get some gardening done, or simply the first signs of Fall, we have a prize to tempt you. All 6 unique Blog POP! blogs will be bringing a minimum of one exciting $40+ value giveaway each day for three days. Visit one of the hosting blogs to follow along with the Giveaway LINKY, and be sure to enter daily to maximize your chances. What do I have in store for you? A week of BistoMD nutrition minded, chef designed, flash frozen meals sent straight to your door! We'll also have a gift certificate to Barefoot Tess shoes, BakeStack kitchen organization unit, Fellowes Laminator from Penny Wise Office Products, and so much more!